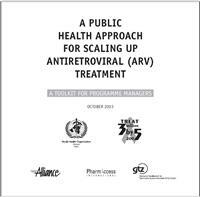 This monograph is a toolkit for planning and implementing antiretroviral (ARV) treatment programs in resource-limited settings by providing technical guidance on planning treatment programs. It lists the goals of an ARV treatment program as reducing illnesses and death due to HIV/AIDS, providing safe and effective treatment, working towards providing universal access to treatment, making the best possible use of resources, and integrating ARV treatment with other public health resources. The monograph discusses the following components of an ARV treatment program: guiding principles of ARV treatment, components of ARV treatment programs, planning, enabling public policy environment, involving and mobilizing stakeholders, supply management of commodities, service delivery, human resources, infrastructure, costing and financing, management systems, information management and communication, and monitoring and evaluation. Dhaliwal, M.; Okero, A.; Schillevoort, I.; Green, C.; Conway, S.; Jain, A. 88 p.: col., ill.; gloss., refs.